There was a time when if you wanted to play a certain indie game, you’d be guaranteed to see it on either PC or on the PlayStation. While that’s still the case today, the Nintendo Switch is fast becoming the console of choice for a lot of new indie releases and it’s probably due to the unique nature of it. What other console do you know of that can be both docked to a TV and removed for portability while also having the option to play multiplayer on the go on the same machine? With that said, UNTIES and Pocket asked me to check out their latest release, Chiki-Chiki Boxy Racers for the Nintendo Switch and I jumped at the chance, mainly because I love racing games and the graphics on this looked pretty cool. As you can guess, Chiki-Chiki Boxy Racers is a racing game with multiplayer in mind, though it’s entirely possible to enjoy this game on your own. The actual racing mode is mainly track racing on 4 different settings, each with their own set of tracks. Racing is pretty straight forward and one of the stand out elements is the drifting mechanics. Mainly anytime a turn is required, you’ll be drifting through it. It makes for a rather interesting a fun element as you’ll need to take angle of turn and speed into consideration and it’s also a fun way of knocking your opponents out of their turning lines. There are also boosts in the game that make your car faster for a short period of time. Other than the drifting aspect, it’s a pretty straight forward racing game where the goal is just to get to the finish line first. Racing isn’t the only mode you can play. There’s also a “Battle Mode” that consists of four different game types. 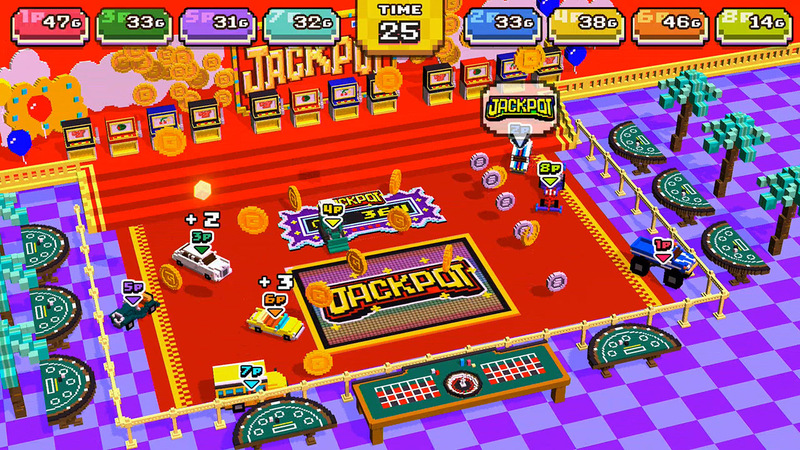 There’s Coin Mode where the object of this mode is to collect the most amount of coins in the time given. Smash Mode where you have to try and knock as many boxes off the island as possible while trying to not to fall off. Next there’s Paint Mode where you’re trying to see who can paint more the area with their color in a given time. 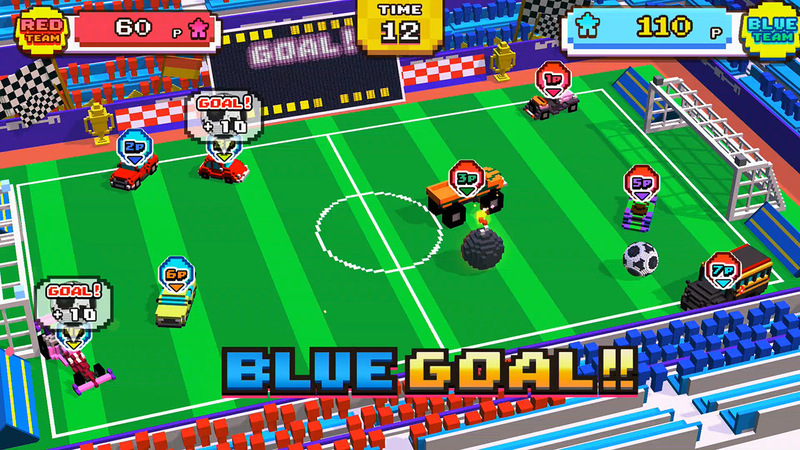 Lastly there Goal Mode where you’re basically playing soccer with cars. 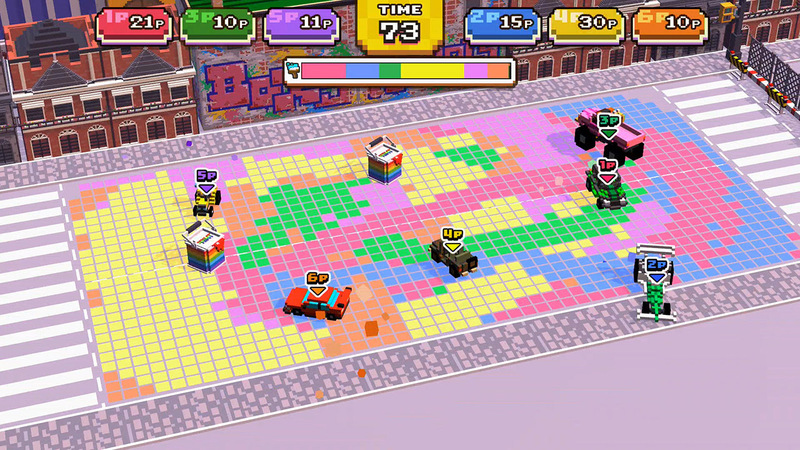 Battle Mode is made more for multiplayer fun but can be played solo as well. It’s not quite as fun solo, as you’re just competing against your self to either get the highest scores or the best times. 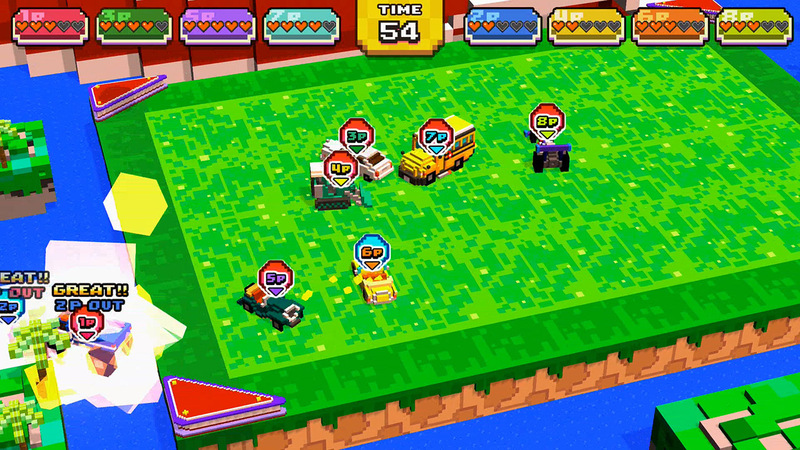 For the most part, Chiki-Chiki Boxy Racers is an excellent little racing game. I love the blocky art style, the fact that drifting is involved, and that there are actually quite a lot of cars you can unlock. Solo play is okay and there’s plenty to do but in my opinion, you’ll have the most fun playing this with a group of friends, especially the Battle Modes. Other than that, it’s a solid game that’s fun and enjoyable whether solo or with friends. Received preview code from developer and/or publisher for coverage purposes.